James Lister is one of the leading guitar makers working in the United Kingdom. His guitars are influenced by the 1938 Hauser, but use a slightly modified strutting pattern which produces guitars that are light and responsive, with exceptional clarity, balance across the strings, and a warm sound. The guitars also have a fine balance between the fundamental note and the overtones, producing a sustain with a smooth decay. This plan shows how to make a bridge with a dual-hole tie-block which enables a smoother path for each string as it leaves the bridge (an increasingly popular feature in contemporary instruments). 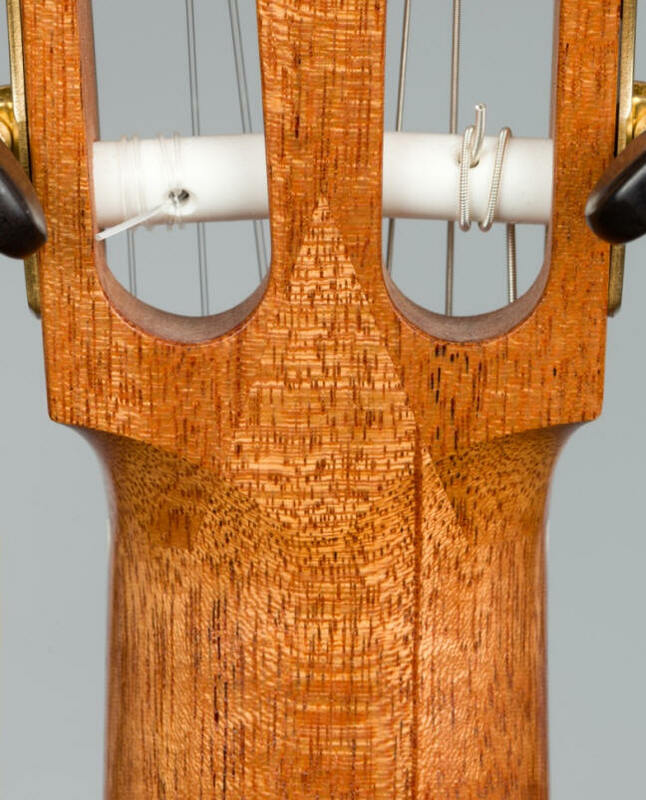 James Lister also uses an unseen graphite-epoxy re-inforcing bar to improve the stability of the neck, without adding any weight. James Lister's guitars have become popular not only for their superior craftsmanship and attention to detail, but because the design produces guitars that are exceptionally sensitive to the touch, allowing players to express their own musicality with ease.